In this week's Torah portion, we read of the most fateful moment for the Jewish people with the giving of our Torah at Har Sinai. We famously read the Ten Commandments that were presented to Moshe Rabbeinu on the two Luchot or Tablets of Stone. There is an interesting custom for the congregation to stand during the public reading of the Aseret Hadibrot as a sign of respect for this holy and awesome moment being recounted. Maimonides, the Rambam, suggests that the congregation should stand for the entire Aliyah, and not just the Ten Commandments. The rationale is simple and logical. One should not think that these ten mitzvot are more important than the other six hundred and three. 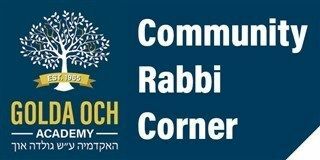 While it may be natural to stress certain commandments over others, and while there may be some that are easier than others, and while there are some that are even more enjoyable than others, the bottom line is that they are ALL mitzvot and we have to treat them all equally to the best of our ability. Luckily, the student body of GOA is blessed to be able to learn in a warm and nurturing environment which teaches the beauty and love of all the mitzvot.